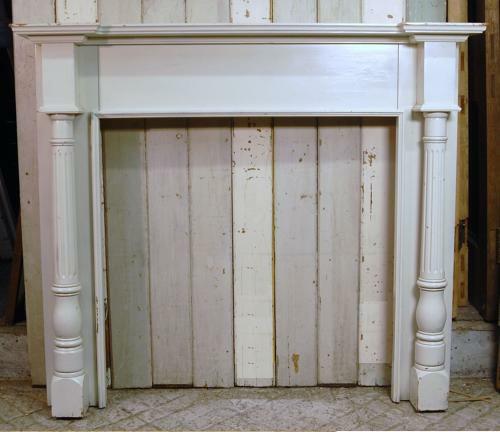 A highly decorative, reclaimed, antique painted pine fire surround. The surround has a stepped border around the mantel and large columns at the front of each leg. The columns have delicate details and solid feet. The wide fire opening has a simple moulding around its edges. The surround is painted with a gloss cream paint but can be stripped and refinished by purchaser as desired. The fire surround fits well with one of our tiled inserts. Please see our listing, reference 547, for details. The surround is reclaimed and therefore has some signs of wear. There are some knocks and slight damage to the mantel corners and legs. Some slight chipping to the paint can be seen. There are some light marks and signs of wear. An attractive and pretty fire surround that would be ideal pared with a tiled fire insert. Perfect for a period home.